An extraordinary ‘couple’ of the Navajo Nation embarks on a long journey into the heart of America, giving deep insights in its dramatic family history. The film INTO AMERICA - THE ANCESTORS' LAND is protected by copyright. All content is permitted only for private, non-commercial screening. No unauthorized reproduction, rental, performance or broadcast. If you wish to use the film other than for private use, please contact sales@filmakademie.de for licensing. Program content and photos copyright 2013 Filmakademie Baden-Württemberg GmbH and Nadine Zacharias. An extraordinary couple embarks on a journey INTO the heart of AMERICA starting in the water metropolis of Seattle and heading for THE sacred ANCESTORS’ LAND on the arid Navajo Reservation. 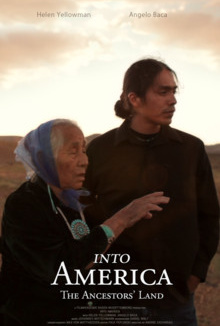 Showing a dramatic family portrait of a loving grandmother, Helen Yellowman – an enchanting traditional Navajo storyteller who refuses to speak English – and her adult grandson – a young academic who commutes between the two worlds, this road trip reveals an unknown America. As both navigate through America’s contradictions, nonetheless celebrating their strong connection to the homeland, it gradually comes to light: the Ancestors’ Lands are being desecrated.